Epic Games is continuing its assault on the Steam status quo. 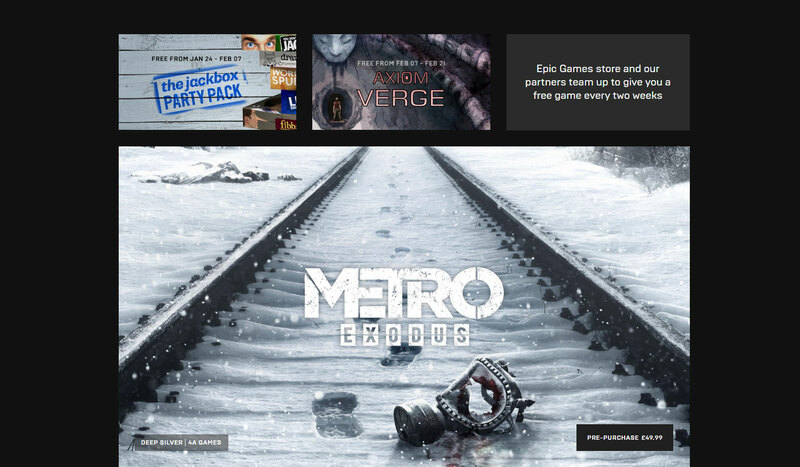 Along with maintaining exclusive access to its monster hit, Fortnite, Epic has now acquired the exclusive rights to sell Metro Exodus through its store. Gamers are torn on the move, with some praising the idea of a competing storefront, while others are sad and frustrated that they can't play the game they were excited for on Steam — especially since the Epic Game Store lacks some major features which have been common place on other platforms for years already. "Later today, sales of Metro Excodus will be discontinued on Steam due to a publisher decision to make the game exclusive to another PC Store." It went on to explain that all previous sales of the game on Steam would be honored and that gamers would be able to play the game through Steam. However, future sales would only be possible on the Epic Game Store. The same goes for any preordered DLC. Valve responded to this news stating that: "We think the decision to remove the game is unfair to Steam customers, especially after a long pre-sale period. We apologize to Steam customers that were expecting it to be available for sale through the February 15th release date, but we were only recently informed of the decision and given limited time to let everyone know." No need to worry, Just pirate the game and this will put the spanner in their works lol. Competition is good. But in some third world countries. People use team "top-up" cards to buy games because the banks are corrupt BS that rob your accounts slowly when you use it to buy on online stuff.